It was another stellar year for Edmonton’s iconic agricultural showcase, Farmfair. Attendance was up and as promised, here are the results from a few of our favourite events. Mark your calendar for next year’s Farmfair being held November 7-11, 2018, at Northlands. The ever-increasing popularity of the Heritage Ranch Rodeo was evident by the packed house for each of the three matinee perfs. 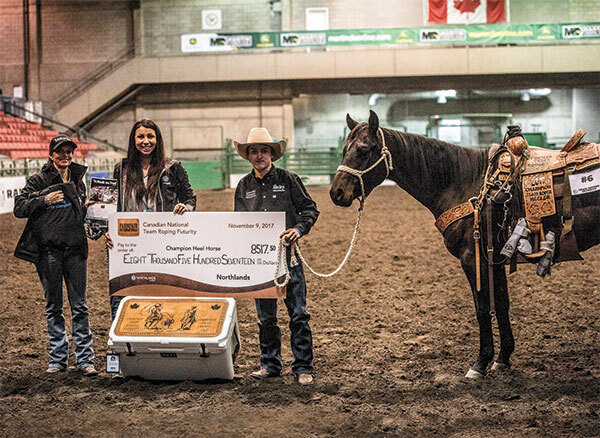 There were some hard-won victories in the dirt, but out of it all, congratulations to the first place winners, earned by the combined cowboys from the Mesabi Ranch and the Anchor P with 44 pts; second place went to Meadow Springs Ranch with 39 pts and third place went to the Rocking Chair Ranch with 38 pts. The event’s Top Bronc Rider was Dustin Sippola riding for Jenkins Lazy U Ranch, and the Working Cowhorse Award was won by Clint Swales from Roseburn Ranch. Twenty head of quality horses were on offer at the Bloodstock Sale, with the average sale price reaching $4,631.25. The high selling horse was Hes Wright Smart, commissioned by Draggin S Horses, who sold for $18,000. 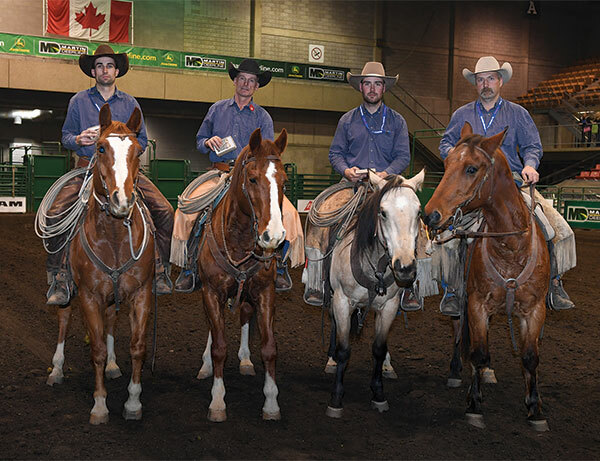 The team roping futurity attracted some of the top ropers and their mounts. 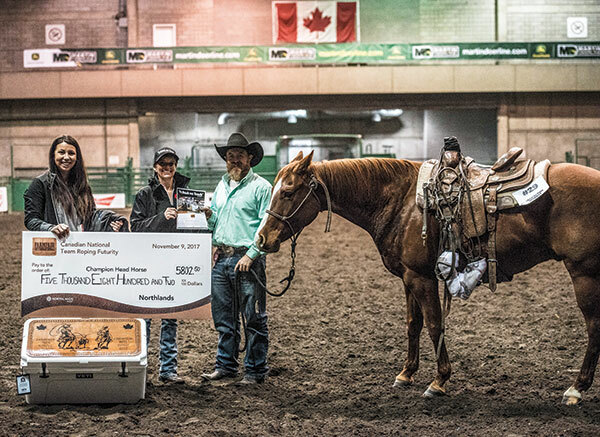 For the Headers, Tel Flewelling riding his horse, Pepinics Duallin Cat took first place with 594 pts; second went to Katie Waterson on Playboys Hot, owned by Waterson and 2016 World Champion Heeler Jeremy Buhler with 590.5 pts and in third was Dawson Graham on his horse, Chex Your Gun with 590 pts. 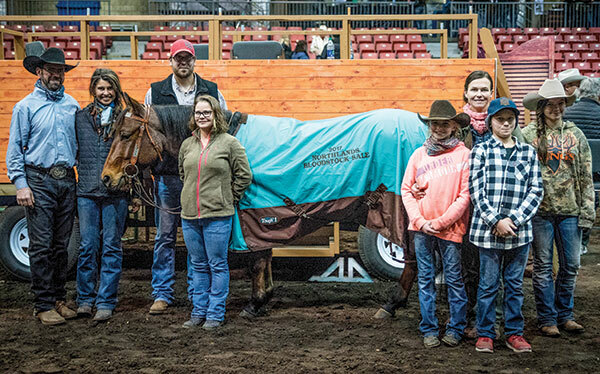 On the other end, the Heeling was won by Kash Bonnett on his horse Pistol with 588 pts; second went to Rhen Richard on his horse, Giocci with 585.5 pts and Shad Field rode Remedy, owned by Rhen Richard to a third-place victory with 584 pts.